My first encounter with the music of South African guitarist and singer Jonathan Butler was at a sold out concert in Boston, MA. Although I knew some of his music, I was blown away by his nimble guitar playing and extraordinary voice. That night, he became a Gswede favorite! One year later, I was on vacation in London – aimlessly walking around a huge flea market. I‘ve never been that interested in these type of all day selling places so I was passing the time by "people watching" which is never boring. I spotted a man who probably had my same mindset as he was sitting alone on a step. He looked very familiar. As I got closer, it became very apparent who it was. I’m not surprised very often although this moment was a big one – it was Jonathan Butler. Never being shy about approaching well known or famous people, I told him how much I enjoyed the aforementioned concert and how his music had touched me. He was gracious and we spent a few minutes talking. As you probably inferred, I was not happy about going to this flea market. I compromised that day as my girlfriend at the time wanted to go. Since then, I have tried to make a habit of embracing situations/invitations I wasn’t fond of as one never knows what interesting moments may occur. About ten years later, I became Director of PR and Advertising for a financial organization. Part of my responsibility was promoting the company utilizing sports sponsorships and concerts – one of the most fun aspects of my new job. There were numerous events throughout the year including the New York Knicks and the New York Rangers along with a diverse group of concerts. A Long Island jazz concert would give me my second random meeting with Jonathon Butler. My company was the major sponsor of most concerts we were involved in and this jazz concert was no exception. I had carte blanche for this event including but not limited to backstage passes and guest invitations. Never being one to exploit my privileges in business, I only invited 3 close friends. It was a beautiful and warm summer night and I was more excited than usual as I knew I would have some quality time with Jonathan Butler. I didn’t mention to my friends that they were going to have special VIP access, including pre-concert drinks to mingle with the artists. They were beyond thrilled when we arrived and were escorted to a private area filled with great food, drinks and interesting musicians. After meeting and greeting nearly everyone in the VIP section, I asked Jonathon to sit at our table so we could get some private time with him. My guests learned about his life and rise to stardom despite the conditions he grew up in. It was a wonderful thirty minutes for all of us. Our time with Jonathan was special as he inspired us with stories of his challenging childhood along with his love of music. In addition, he couldn’t have been more kind to my guests; not dissimilar to our first meeting ten years earlier. To gain a small taste of his life and talent, take the time to watch this ten minute video interview (he sings!) from the Tavis Smiley program. Every time I hear his powerful and soulful voice, it moves me. If you love music, you may be moved as well. 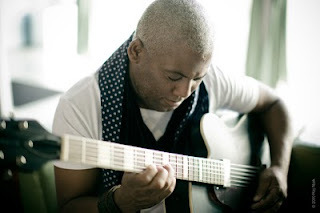 Jonathan Butler is an incredible musician. Thanks for sharing this post. More people should be aware of him and his music.